Chalkboard features wholesome ingredients carefully selected just for the catering department. Our menu items are hand-crafted: Meats are slow roasted in house, bread baked daily, fruits and veggies picked seasonally and organic when possible, and from scratch desserts. Check out our catering reviews! 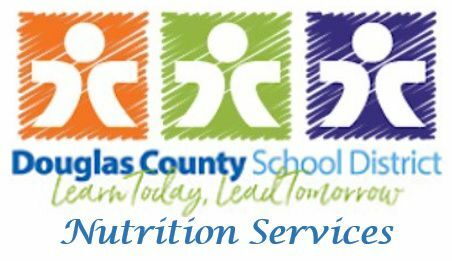 100% of the profits from DCSD catering program goes right back to the Douglas County School District. We are tax exempt, gratuity free, and do not charge fees for: set up, delivery, serving, or cooking on site. Everything we make is crafted by Executive Chef Ryan Repplinger, our Catering Team and YOU!. With decades of cooking, catering and menu crafting experience, we’d love to serve you great food that fits into your specific budget. Give me a call! Let’s talk through your event! catering@dcsdk12.org or (303) 387-0306. Grilled flour tortilla with your choice of bacon or sausage, roasted potatoes, cheddar cheese, and scrambled eggs served with green chili and salsa. The buffet price is tailored to your budget. You and Chalkboard write the menu and price based on your needs. Pick and choose what you like or add your favorite dishes! For those big meetings we offer a mix of all four sandwiches, salad bowl seasonal fruit, water and a mixed cookie plate. Serving utensils, plates, silverware and set up are always included. In-house roasted and sliced Turkey served on fresh baked white bread with cheddar, bacon, romaine, onion, and tomato. In-house roasted and sliced honey ham served on a with cheddar cheese, romaine and tomato. In-house roasted chicken breast on a croissant with creamy dill dressing, celery, and red grapes. Fresh baked honey wheat bread with tart lemon hummus, spring mix, red peppers cucumber, and tomatoes. Ciabatta bread with sliced eye of round steak, tomatoes, caramelized onions and horseradish aioli. All salads include a small fresh baked pita and a bottled water. Romaine lettuce and spring mix with a harissa vinaigrette, red peppers, cucumbers, and feta. Topped with in house grilled chicken breast. Spinach with a sweet balsamic vinaigrette, red onions, bacon crumbles, almonds and topped with strawberries. Romaine lettuce with a cilantro lime dressing, corn, cherry tomatoes, red peppers, jack cheese, corn and tortilla strips. Topped with in house grilled chicken breast. Romaine and spring mix with balsamic vinaigrette, tomatoes, carrots and cucumbers. Topped with in house grilled chicken breast.